The fallout from the supposedly “narrow” Supreme Court decision regarding Hobby Lobby was immediate. Similar cases making their way to the Supreme Court at the same time were returned to the lower courts. One of those cases requests an exemption from providing any form of birth control and it is likely that it will be granted. A few days after the Hobby Lobby decision, the Court granted a waiver to Wheaton College. The issue was not the provision of birth control–Wheaton, a religiously affiliated institution was exempted from the provision. Instead, the men of the Court saw fit to waive their requirement of filling out the federally mandated form to receive the exemption, which Wheaton deemed onerous. Justices Sotomayor, Ginzberg and Hagan and were not amused and wrote a scathing dissent. It is misleading and a mistake to define the Hobby Lobby decision in terms of religious based restrictions that can be exercised by certain employers over a woman’s access to birth control. Last week the ACLU and the National Gay and Lesbian Task Force withdrew their support from the Senate version of the Employment Non-Discrimination Act (ENDA) over its too-broad religious exemption. The LGBT community correctly parses the Supreme Court’s Hobby Lobby decision as being wide enough to entertain religious exemptions on the basis of sexual orientation. Jay Michaelson makes the case at the Daily Beast that women’s autonomy has been eroded over the past ten years while the LGBT community has been expanding legal protections of their civil rights. In his article Ten Reasons Women are Losing While Gays Keep Winning Michaelson points out that the issue of equality of status for women, which is the real issue, is being subsumed by the rhetoric of “freedom of choice.” He points to the seismic shift in public sentiment when the issue of gay marriage was redefined as marriage equality. It’s time to bring up the Equal Rights Amendment (again) for a vote! In the meantime, women are not exactly sitting on their hands. Back in the day, Real Women™ could kick start their vibrators and roll their own tampons with one hand. 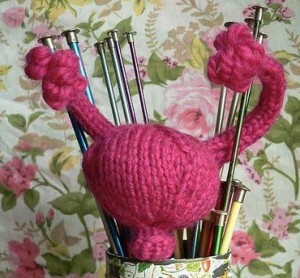 Today, they are making their own IUD. I left a moribund Western Pennsylvania mill town the year that Richard M. Nixon was not impeached for crimes against the American people, and set off in search of truth, beauty, justice and a beat I could dance to. Here I am. The Hobby Lobby decision is all about denying poor women birth control. After all middle class and rich women can afford their own birth control. From payday loans to student loans for bogus degrees, the rich profit from taking advantage of the poor and the ignorant especially now that no one is standing up for them as consumers. 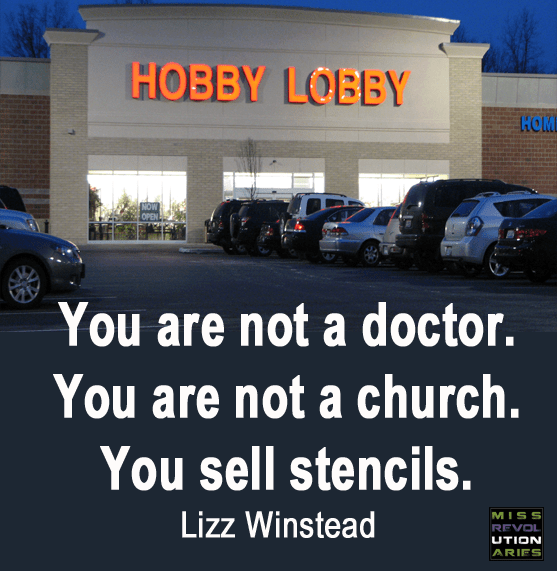 The Hobby Lobby decision is all about denying PEOPLE who do not hold the same religious beliefs as their employer. While the masses continue the predictable path of debating birth control and Obama Care, the power-seekers are gleefully rejoicing in the fact that everyone seems to be missing the bigger picture. Companies have been granted RELIGIOUS RIGHTS! Misdirection works every time. Only one of the consequences is legal denial of certain forms of birth control to women. That is the path the power-seekers hoped we would follow in our outraged frenzy. Our government granted religious rights to a company. That is hard to reconcile. So religious rights trump human rights?